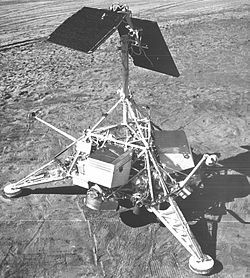 NASA’s lunar lander Surveyor 1 lands in Oceanus Procellarum (“Ocean of Storms”) on the Moon, becoming the first US spacecraft to soft-land on an extraterrestrial body. The previous Ranger program sent craft that had hard-landings (i.e. crash landings). However, the Soviet spacecraft, Luna 9, claims the honor of being the first to soft-land on the moon, almost exactly 4 months prior to Surveyor 1.